Vessels from Australia, China and Malaysia continue to ply the southern Indian Ocean west of Perth as the hunt for the missing Malaysian Airliner continues. While the rest of the world drifts away to watch some reality show and view kitties on their smartphones, this elongated mystery continues. Zhu Kezhen, named after one of China’s most famous maritime scientists and Harvard graduate. Its now at the Bathymetric stage. A machine that drifts down to 3500m underwater and has instruments on board to help those on the surface view the alien landscape that is the ocean floor and maps as it goes. The pressures down there are immense as we all know. Two ships, Zhu Kezhen and Fugro Equator are building a map of the deep. 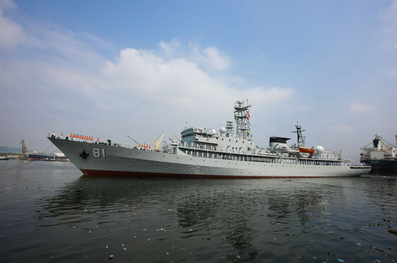 The former is Chinese, the latter, an Australian-contracted survey vessel. First thing: Map that part of the ocean. No-one has. And that is just so unbelievable. We know almost nothing about the undulations and rifts that lie beneath the search area. It’s like Captain Cook all over again. Mapping the valleys and hills. It’s kind of ironic that his navigational descendants are at it again, in the region Cook made famous hundreds of years ago. Yes I know people were already there, but Cook was the one who drew a proper chart. 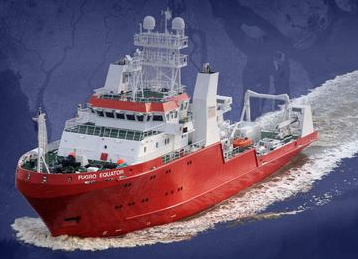 Designed for the Dutch company Fugro, the “Fugro Equator” is fitted with the latest survey equipment to map the ocean floor. So the Bathymetric stage is full speed ahead, charting an area for which charts exist for the surface only. At the same time scientists plotting the aircraft’s trajectory have used a combination of Great Circles – and Rhumb Lines. Sailors used these as the follow a distinct and constant compass bearing rather than the Great Circle, which means constantly changing the bearing. Rhumb lines are straight lines on a Mercator Projection map much loved by Mercator-lovers. But what exactly is a Rhumb Line? As of 7 August 2014, around 40,000 square kilometres of the ocean floor of the high-priority search area have been analysed and mapped. The mapping process involves two stages. Firstly the data is gathered by the survey ships. That data is then processed into a seamless usable form by Geoscience Australia to support a safe and effective deep-water search. 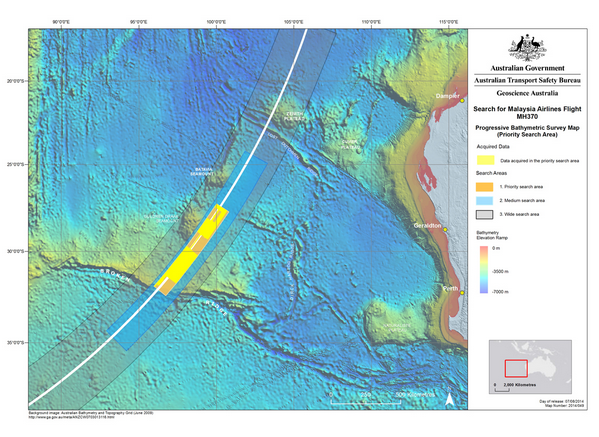 The high-priority search area is around 60,000 square kilometres. It’s a path of constant bearing, which crosses all meridians at the same angle. Great Circles are an orthodrome. They’re shorter but take a lot more maths to successfully chase. And for the scientifically minded amongst us, this starts to become really interesting when taking the Malaysian Airliner in account. If you glance at the map adjacent you’ll see that the airliner was clearly on a Great Circle trajectory. It was flying on auto-pilot which is set to follow magnetic north and are calibrated along way points which follow a Great Circle. 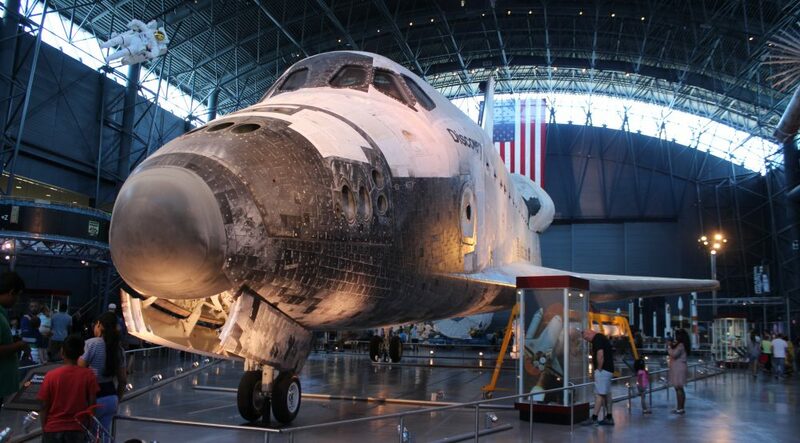 If we take all the known facts into account (which are sparse to say the least), then we could say that this plane was doing what all planes do when flown by crew over vast distances. It was on autopilot following the Great Circle. It was being flown on the most fuel efficient route there is in order to go as far as possible into the middle of nowhere. If you take the trajectory into account, the plane would clearly run out of fuel before it next arrived over land. Because the next land in this direction is the Antarctic. I still believe that its unlikely we will ever know what happened to this aircraft, but its clear the person responsible for taking this route was on a suicide mission. And he really knew how to aviate (can’t be a she because all the crew members on board were male). All signs at this stage continue to point to one of the air crew, I’m afraid.